Whether you are a professional photographer or not, your (often expensive) photography equipment is surely priceless to you. Having an adequate case or a backpack to properly transport and protect your gear is a must. True to our mission to always provide useful and timely information, we have decided to save you the time and the energy usually spent on endlessly searching for the right camera backpack in a myriad of backpacks out there and do the job for you. So, in no particular order, here are our top picks. You are going to love this one since it is packed full of great features. Let’s first talk about storage. The USA Gear S15 Professional has ample storage for everything you need to make quality photographs – from tripods, cleaning kits and flash diffusers to additional lenses and chargers. The backpack is perfect for storing most camera brands out there including Canon, Sony, Panasonic, Pentax and Nikon SLR cameras. It is lightweight (weighs only 1.3 pounds or 580 grams) and its dimensions are 14.5 x 9.5 x 7.5 inches (37 x 23 x 19cm). The USA Gear 15 Professional Sling Backpack has a durable, soft, scratch-resistant Nylon exterior and a padded interior (with five pockets), in addition to a removable rain cover. The backpack has a great ergonomic design and adjustable carry straps for a comfortable use. Last but not least, the USA Gear S15 backpack comes with a three-year manufacturer’s warranty. The first thing you notice about Bestek’s camera backpack is its vibrant orange colour which certainly makes it stand out. This is one of the roomiest backpacks out there, made of high-density, sturdy, waterproof Nylon that is suitable for all kinds of weather which is easy to clean and wash. In the back of Bestek’s organizer bag is a thick mesh which allows for excellent air permeability. The straps are heavy padded and customizable while the bag’s main compartment can comfortably hold cameras, lenses and relevant equipment which are protected by a durable fabric cover. The compartments are divided with foam-padded dividers which are also customizable. Bestek camera backpack also has pockets on the front side which can hold various small accessories. The side straps and elastic cord can hold both umbrellas and tripods. The backpack’s dimensions are (L*W*H) 25 x 21 x 41cm (or 9.9 x 8.2 x 16 inches). 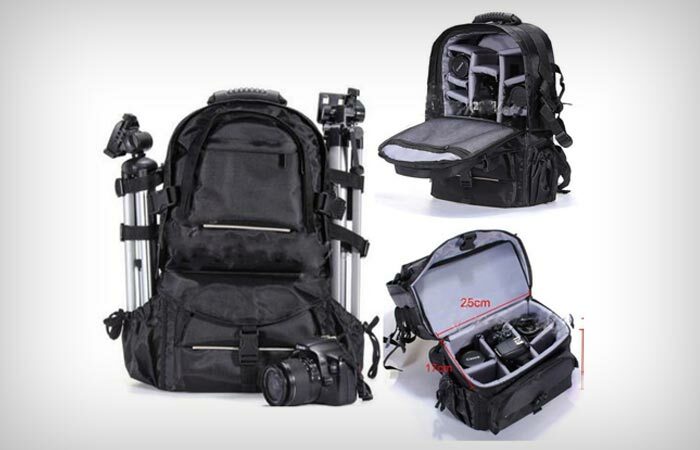 This is a very versatile backpack since it can hold a full range of cameras, camera equipment and even a MacBook Pro (15-inch) or 14-inch-PC. 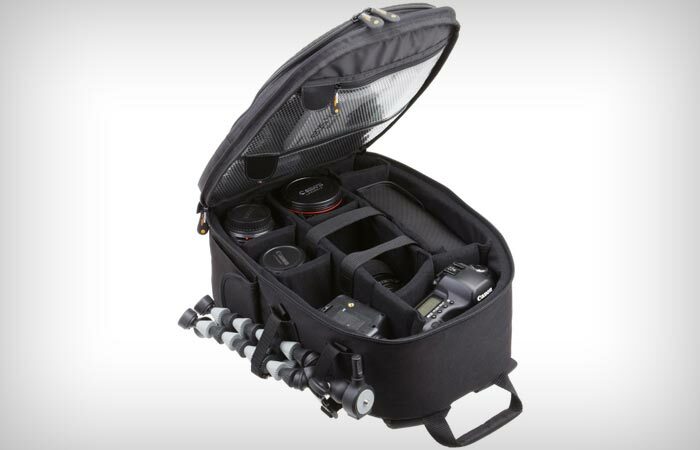 The Case Logic DCB-309 backpack is suitable for storing SLR cameras with lenses (up to 200mm) attached. There is a customizable divider system which can take up to three additional lenses, flash and other related gear. Of course, the backpack is weather-resistant. It is very practical too since, when in not in use, you can roll it into a provided stuff sack. The zippered side pocket can hold a tripod while the front pocket is ideal for storing small non-camera accessories. 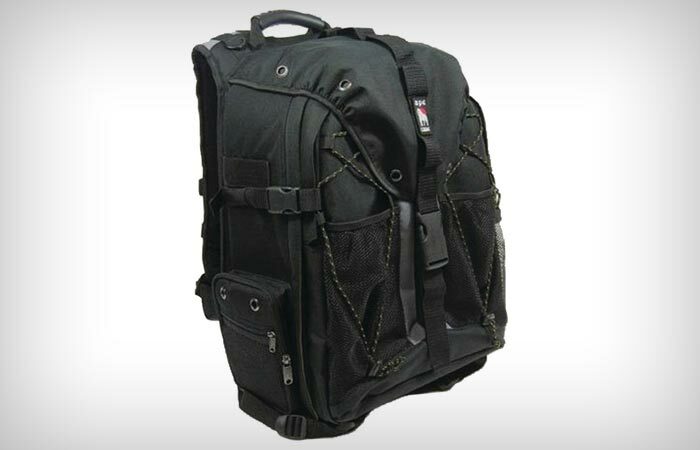 The Case Logic DCB-309 backpack weighs 3.5 pounds and its size is 12 x 9.1 x 19.5 inches (or 30.5 x 23 x 48 cm). The backpack’s front is well-padded to ensure proper protection from impact. Also, there is a mesh water bottle pouch on the side. The BP backpack is deluxe indeed! Let’s start with the storage – it has seven inside dividers, two webbed side pockets, a zippered pocket for water bottle (or other accessories), a tripod strap, and a Velcro inside pocket ideal for storing filters and other equipment. In addition to the aforementioned features, the BP Deluxe Digital / Video Backpack has a padded carrying handle plus two rubber feet. The backpack is exceptionally comfortable to wear thanks to its soft, cushioned shoulder straps which make all the weight spread out evenly on your shoulders and back. The backpack’s construction is sturdy and durable. The BP Deluxe is made from durable, easy-to-clean, microfiber cloth and its outside dimension is 12 x 6.5 x 15 inches (30.5 x 15.24 x 38cm). This camera backpack is one of those rugged, robust, almost impossible to destroy, typical man’s backpacks. 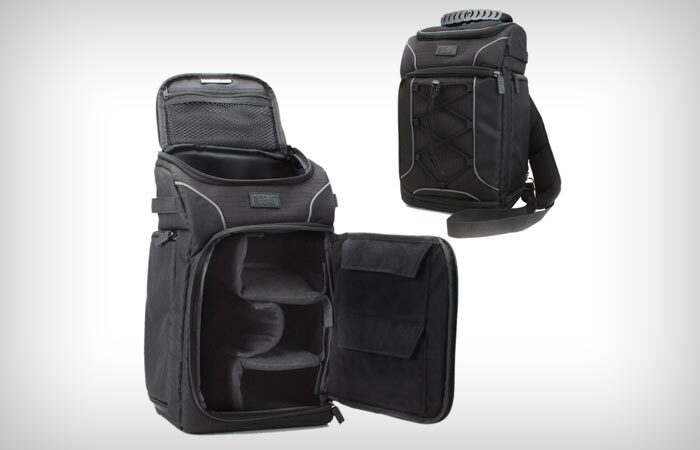 The Ape Case Pro Digital ACPRO2000 is the backpack to go to, if you want plenty of storage. On top of your cameras (it can fit two digital SLR cameras), you can also store up to eight lenses, battery packs, accessories, paperwork, and other necessities. 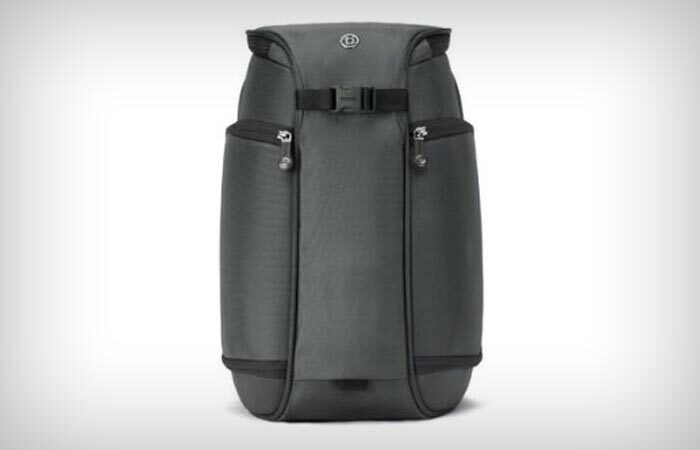 This amply padded backpack can further store two tripods and a 17-inch-notebook computer. ACPRO2000 is weather-resistant and has a pull-over rain shield (which you can tuck in when not in use) which will protect your camera equipment even in extreme weather conditions. The shoulder harness system is very comfortable and ideally contoured. The product dimensions are 19 x 12 x 10 inches (48 x 30.5 x 25.4cm) and it weighs 6.9 pounds. This is a backpack that is favourite with trail runners, cyclists, snowboarders and adventure sport athletes in general who like to travel fast and light. One of the original features of the Lowepro LP36354-PAM Photo Sport 200 AW is ultra-cinch camera chamber which, apart from protecting your camera gear thanks to a well-padded, secure compartment, also prevents the equipment from bouncing while you are in motion. The side pockets allow for a quick access to your camera while the top compartment gives you up to 13.9 litres of space for your personal things like mobile phone, lunch box or piece of clothing. Also, the Lowepro LP36354-PAM has a hydration pack pocket. 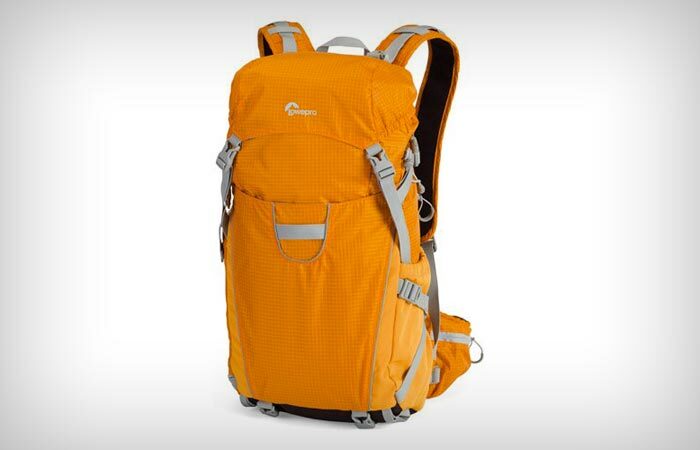 Apart from being very light (weighing only 2.9 pounds), this backpack also has ergonomic waist and sternum straps. You can store a small, lightweight tripod on the side. Its dimensions are 10.5 x 19.2 x 6.6 inches (27 x 48 x 17cm). This is yet another great stow-it-all camera backpack made from strong polyester/nylon. The backpack is distributed by Amazon.com and has one-year-AmazonBasics warranty. It comes with plenty of space thanks to several pouches, compartments and pockets suitable for storing two smaller SLR/DSLR cameras, up to four lenses and several additional accessories like batteries, memory cards and USBs. The AmazonBasics backpack also comes with two side pockets with flaps (great for personal items such as keys and mobile phones) and two large pockets which can be used for storing notebooks, paperwork or even a light jacket. The backpack’s side straps can hold a small tripod or an umbrella. The backpack’s main compartment is lined with fabric covered foam for added protection. The foam dividers can be repositioned to your liking. AmazonBasics Backpack’s outer dimension is 11.5 x 7.2 x 15.6 inches (29.2 x 18.3 x 39.6cm) and it weighs only 1.9 pounds. 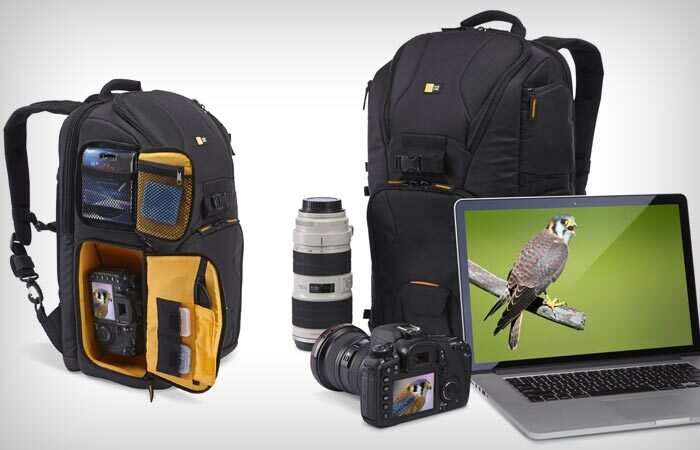 Here is another rugged-looking camera backpack produced by the world-renowned Case Logic. What’s special about Kilowatt KSB-102 backpack is that it has three carrying configurations – over the right or shoulder (so-called sling pack) and the backpack configuration. Additionally, there are three ways you can retrieve your camera and equipment from the Kilowatt KSB-102 backpack and they are gear-left, right and front. This backpack is all about practicality, ample space and fast access to your photography equipment. 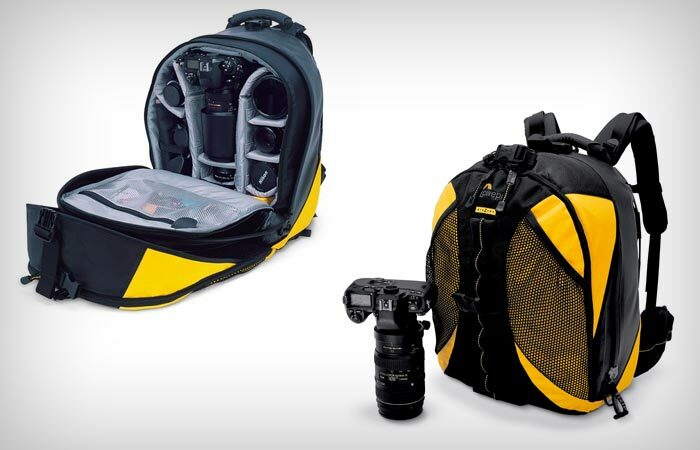 It is designed for transporting DSLR cameras with up to eight-inch lenses attached. 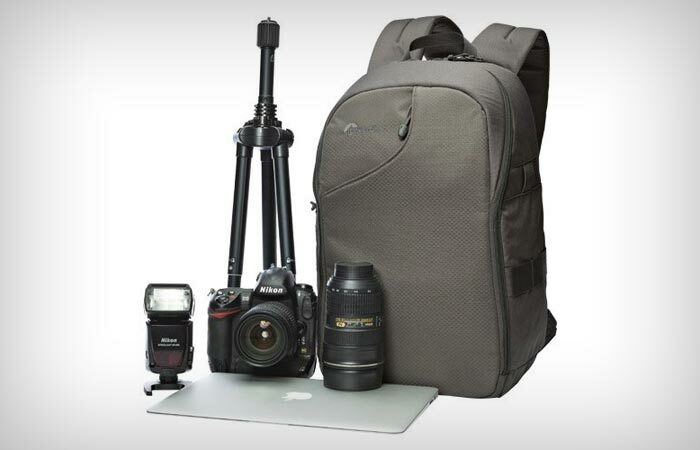 You can also stow away additional lenses, various accessories and a 15.6-inch-laptop. The camera backpack is protected by a weather hood and its case is exceptionally well crafted. As far as the interior goes, Kilowatt KSB-102 has fabric-lined padded dividers which are customizable, and a flexible strap to secure the camera in place. There is also a slip pocket intended for internal memory card and lid pockets in which you can transport filters or lens caps. The laptop compartment’s dimensions are 15.2 x 10.5 x 1.2 inches (38.6 x 26.7 x 3cm), while the backpack’s outer dimensions are 11.8 x 10.2 x 18.5 inches (30 x 25.9 x 47cm). Case Logic Kilowatt KSB-102 weighs 3.65 pounds (1.66kg). Whether you are a professional, semi-professional and amateur photographer, you are going to love Python Slimpack backpack, designed by Booq Bags. 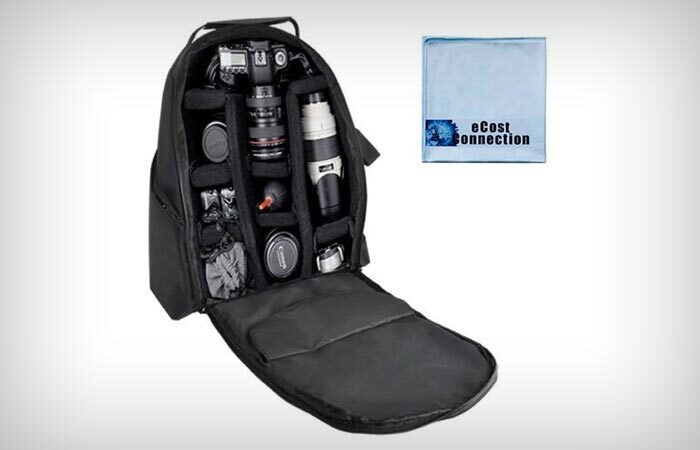 This backpack can store just about anything you might need for your photographic endeavours. It is a sturdy, water-proof, ergonomically designed bag which will keep your cameras, lenses, tripods, and tablets safe and protected. The Python slimpack is made from ballistic nylon fabric coated in a water-repellent substance. It also has a removable cover to protect the bag during heavy rain or snowfall. The beauty of the Python slimpack is that it has a rigid compartment with padded walls and dividers which can be adjusted to fit photographic equipment of choice. The Python can easily store one or two DSLR cameras, up to four medium size lenses, one large zoom lens, a tripod and a tablet / iPad. Because of its two-strap design you can access your gear from whichever direction. Python slimpack is lined with jersey and has high-quality durable YKK premium zippers. It also comes equipped with Terralinq, and a lost and found serial number written on a metal label. Once you register the product’s serial number with an identity, nobody can claim it’s theirs. If you report the slimpack as lost, Terralinq will get in touch with you with the bag’s location and the contact information of the person who found it. This is truly the world’s first, absolutely waterproof, soft-sided camera backpack which acts as a dry suit for your photographic equipment. Even when completely loaded, this camera backpack will not sink which ensures that your gear is protected at all times. It has a patented inner dry pod while itswaterproof TIZIP™ Easy Seal zipper provides complete protection. Other features of Lowerpro DryZone Backpack are as impressive. There are self-draining outer pockets, a handy tripod holder, a separate generously padded camera compartment which has an adaptable divider system, a comfortable harness with CollarCut™, waist and sternum straps, and a soft ergonomic rubber handle. You can also widen the backpack’s capacity thanks to the SlipLock™ attachment loops. Of course, you don’t need to be a professional photographer to use LowerPro DryZone Camera Backpack. How about taking it on one of your kayaking or canoeing adventures knowing that your camera gear will be perfectly safe in this watertight rucksack? Not only does LowerPro DryZone have enough room for your camera, a zoom, cables, a tripod, accessories, and whatnot, you can also easily fit lunch snacks and toiletries and they will remain bone dry even if immersed in water. 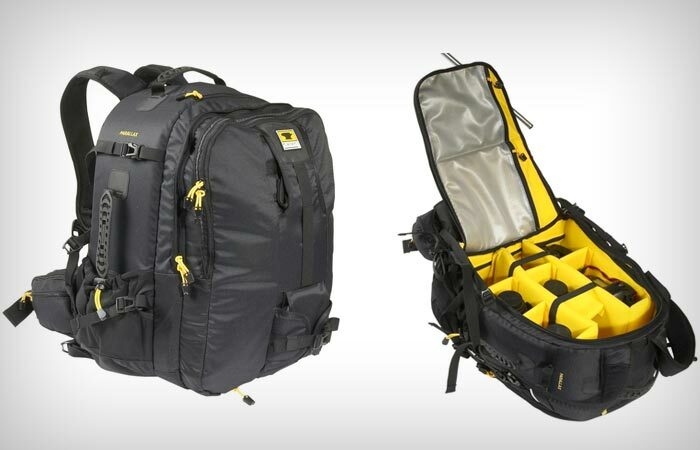 This is yet another Lowepro camera backpack worthy of your attention. Fast access to your gear is guaranteed with this backpack since it has a zipper side opening and the backpack easily rotates from back to front. This is also a multi-media backpack, suitable for storing anything from cameras and smartphones to tablets, 13-inch-MacBook and accessories. LP36577-PWW 350AW’s flexibility is ensured thanks to the UltraFlex fit system which offers several ways to configure both the cameras and the personal items inside. This backpack is very versatile and light. Its top compartment can carry anything from a bottle of water and food to extra batteries, memory cards or lens cleaning pens. There is even a cup for holding tripod feet. The shoulder straps are ergonomically designed and comfortable and while the waist strap can come useful for hiking. The product dimensions are 11.9 x 18.7 x 9.4 inches (30 x 47.5 x 23cm) and it weighs 2.4 pounds. The incredible versatility of this camera backpack / travel bag is contained within its lengthy title. You want a backpack with plenty of pouches and compartments that is also a camera carry shoulder / travel bag? Look no further, this is the one for you. The 2xhome Large Deluxe Pro backpack is made from the best materials around. You won’t find any hard plastic casings, plastic bindings or wire ties in this backpack. 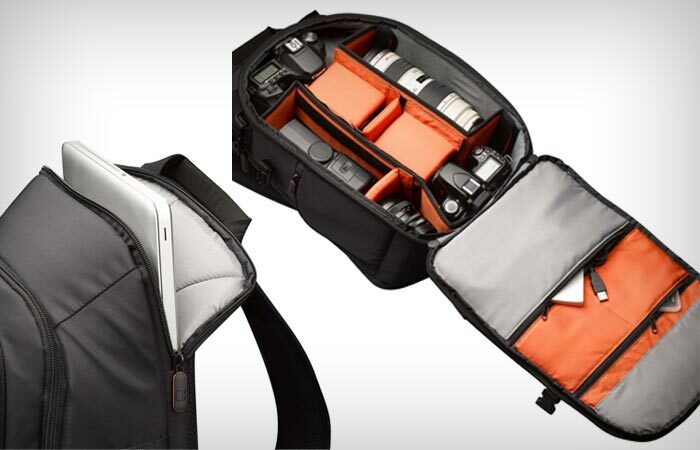 It features adjustable padded dividers, which ensure optimal storage, which fit just about any DSLR camera around. Your equipment will be fully protected thanks to fabric lined foam which is used throughout the backpack. Shoulder straps are wide and comfortable, and there are also adjustable waist and chest straps. The customizable side straps, positioned on both sides of the backpack, can carry tripods, umbrella or other large items. The 2xhome backpack has zippers all around, and large pockets. Its external dimensions are 18.5 x 13 x 6.70 inches (47 x 32 x 17cm). 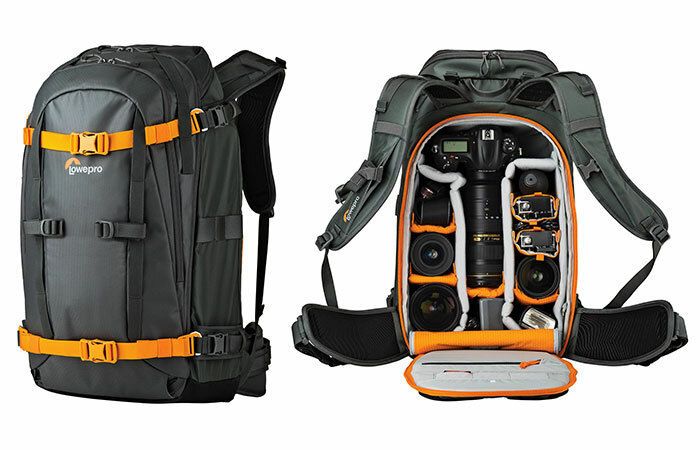 Now, here is a novel concept in the world of camera backpacks. The Mountainsmith Parallax has a recycled polyester frame sheet inner structure which gives the backpack excellent load stabilizing properties, on top of added equipment protection. The Parallax also has a back panel access, mesh side pockets, and top and side rubber moulded haul handles. The interior dividers are adjustable and padded. Also, the interior is fleece-lined. Should you find yourself in heavy rain or snow, do not fret about your equipment since the Parallax has a removable storm cover. Additionally, there is a belt pouch which you can use for batteries, memory card and USBs. 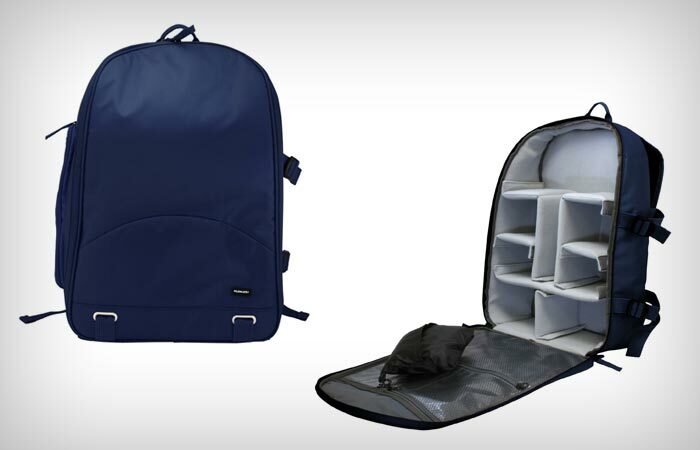 The backpack comes with a laptop sleeve (dimensions: 12.75″ H x 10.25″ W x 2.25″ D), which can store 17-inch-laptops. Its bottom straps can be tucked away for extra comfort. The Parallax weighs 5.6 pounds (2.65kg), and its volume is 1,952 cubic inches / 32 litres. The product external dimensions are (L x H x D): 18 x 15 x 11″ (46 x 38 x 28cm). This is the only single-pocket camera backpack we are featuring here, and is one of the most practical and refreshingly simple in terms of design. The Filemate 3FMCG220NV2-R ECO Deluxe Camera Backpack is not too bulky and stands up on its own. It is available in several engaging colours and is a great value for money. The Filemate backpack comes with a water-resistant protective cover, large compartment dividers (secured with Velcro straps) which securely protect your camera, and smooth-running zippers which allow easy access to your equipment. 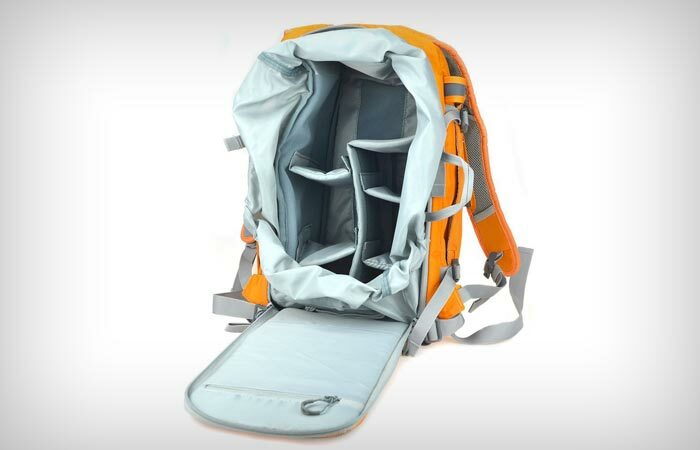 The interior pocket system comprises of three pockets – two small and one large, while the backpack’s outer pocket also has a smaller pocket inside. The side straps will hold your tripod in place, while the backpack’s sleeve is lined with padded material for additional safety. The Filemate 3FMCG220NV2-R ECO Deluxe is a very sleek, contemporary-looking, durable, lightweight and very functional camera backpack. Its dimensions are 12.8 x 16.1 x 6.8 inches (32.5 x 41 x 15cm). With back panel zipper, you can easily access to your camera and lenses. There’s one more camera backpack you should check out. Lowepro Whistler will accommodate all photography tools and protect them the best way possible. It’s made from waterproof, abrasion-resistant, rip-stop nylon that is TPU coated. This backpack is also very lightweight. It has separated compartments with drain holes so the water doesn’t damage the equipment. You can access all or just some compartments with a hinged back panel zipper. For even more protection in extreme weather conditions, there’s a special Detachable All Weather Cover. With ActivZone harness system, it will be easy to carry this backpack, and it will give you stability and comfort. The great thing about Lowepro Whistler is that it isn’t just for cameras. You can expand the large front pocket and put wet gear like rope, shovel, crampons. It also comes with heavy duty attachment points so you can carry snowboard, skis, ice axes, tripods…There’s also a smaller model of Lowepro Whistler.